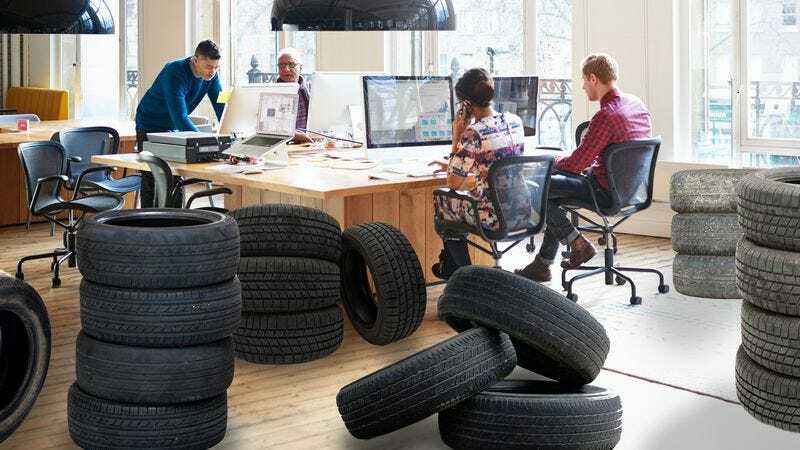 Most companies produce an alarming amount of waste in order to make their products, but one environmentally conscious startup called Green Wheels is turning that production model on its head. The innovative San Diego-based company takes old car tires and will figure out something or other to do with them eventually. Here’s how it works: Green Wheels collects old and beat-up tires from junkyards and also accepts donations from individuals who have old tires lying around that they want to get rid of. They then store the tires in a warehouse, and you’ve got to think that sooner or later they’re going to find a good use for them. Maybe using them to make some type of bag? Rubber’s kind of a weird material for a bag, so maybe that’s not quite right. But whatever it is, it’s going to be a big win for sustainability. Awesome! Our Mission: Ever notice those huge mounds of tires that are in junkyards? We did, too. And that got us thinking: What if we could take those tires and… melt them? Or, no, not melt them. But mold them, maybe? Into a different thing? Definitely something like that seems possible. Because while most people look at an old tire and see an old piece of junk, we see a brand-new opportunity of some sort. As soon as we figure out what it is, get ready to see a lot fewer tires sitting around taking up space, and a lot more hammocks or phone cases or something. So what are you waiting for? Donate your old tires to us today! Wow. It’s pretty incredible to see a company take something as useless as a worn-out old tire and presumably transform it into something amazing at some point down the line. We definitely want to buy whatever they end up making out of those old tires once they nail it down. Way to go, Green Wheels!